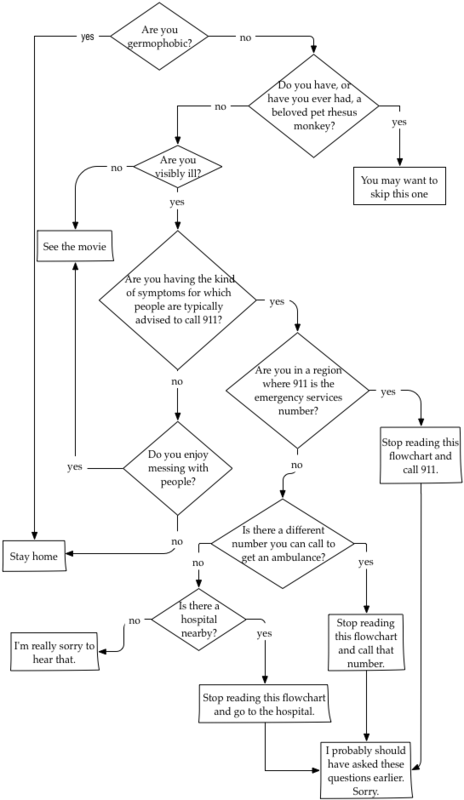 Here’s a handy flowchart to help you decide whether or not to go see Contagion. One tip: if you see this movie with a group of people, one of whom is very germophobic, and the rest of you have a betting pool to guess how many minutes of the movie that person will be able to take, then you should probably pick a number less than 10. Ha — I never thought of that possibility. ok I’m calling the ambulance now. I do have a pet rhesus monkey, but I wouldn’t exactly call him beloved. If he doesn’t appreciate the home you’ve provided for him, you should definitely take him to see this movie. This clears up my confusion on seeing this movie. Thank you- you’re doing a good service. Rhesus monkeys aren’t even beloved by their own mothers. I’m pretty sure the mommy monkeys didn’t volunteer for that experiment. What happens if you have a beloved pet human? I’m confused. I’m confused too. I see humans die in movies all the time, but then I see those same humans in other movies. I jut walk around spraying others with Lysol and using hand sanitizers. I don’t think I should see this movie. Probably not, but you might enjoy hanging out in front of theaters where this movie is playing, offering movie-goers a Lysol spritz as they leave. Haha, I wash my hands after every time I shake someone’s hand, grab a doorknob, use a tv or game remote, etc. I don’t know if I should see this one. Awesome idea with the flowchart. The opening sequence of the movie — before anyone gets seriously ill — shows people just going about their daily business, walking around and touching stuff. It would probably make you run screaming from the theater. You can’t be too careful. Germophobia is highly contagious. I’m notoriously nongermophic… I trained for a job that involves a lot of blood and vomit and such and it just doesn’t bother me. Coughing…sneezing…touching…don’t care. Doesn’t bother me. This movie made me wash my hands vigorously with soap (which I almost never use due to an allergy, it makes my hands all raw and itchy) for days. Also, the medical geek in me was thrilled when Paltrow had her seizure on the screen…first time I’ve ever seen a real, accurate, seizure in a Hollywood movie. The math geek in me was annoyed that the percentage of people we saw dying from the illness was vastly different than the percentage of people that they said died from it. We saw Contagion last night. I desperately wanted to wash my hands, the monkey in the body bag was sad, and the math was ticking me off. But I really liked it. I wonder, though, if epidemiologists watch it and get mad like I get mad about shows about PR people. One of the reasons I wanted to see it was that I’d heard an interview with a virologist who’d consulted on the movie and said it would be more accurate than most. Here’s an article about CDC staffers’ reactions to the movie. i do not have a pet rhesus monkey but the rhesus monkey scene still had me fighting tears. Maybe I should change my blog name from Unlikely Explanations to Bad Advice.